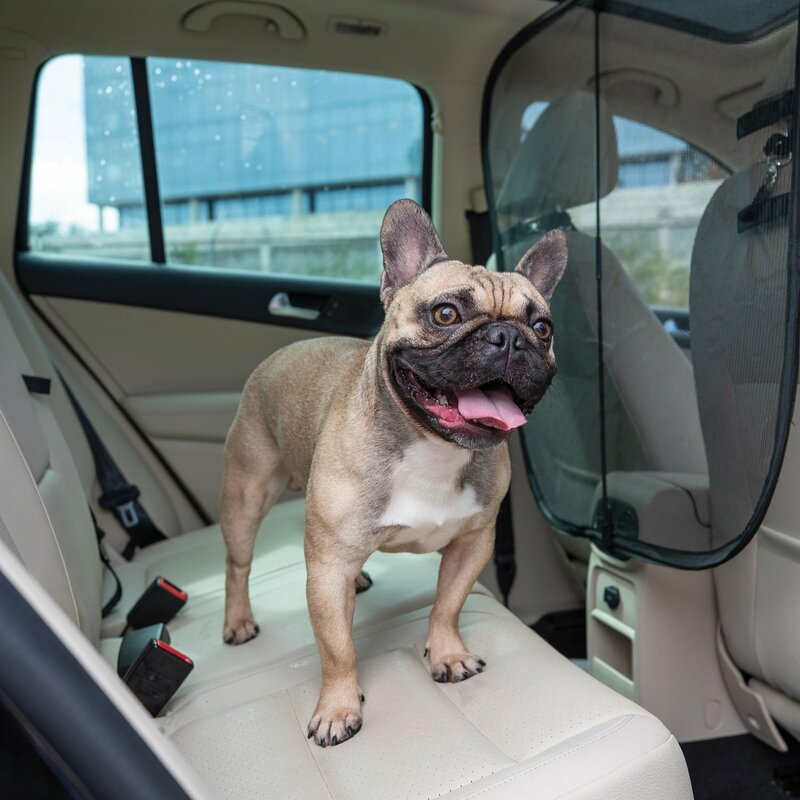 The Front Seat Net Pet Barrier helps keep your pet from "inviting" himself into the front seat, thus reducing driver distraction and increasing safety. Solvit's patented design uses a micro-mesh material which improves driver visibility and is "claw-proof". The netting is attached to a pop-up wire frame which keeps the net from sagging and makes it a snap to install and uninstall. A central support rod increases the net's strength and a Sta-Put device helps hold the net firmly in place. Designed to fit all vehicles with headrests, from sedans to full-size SUVs and comes complete with a storage pouch. The Front Seat Net Barrier works excellent in tandem with Solvit's Bench Seat Cover or Hammock Seat Cover. Adjustable suspension system fits all vehicles with headrests. Claw proof micro-mesh makes it easier to see through than metal tube barriers. Pop-up wire frame keeps net from sagging. The barrier acts as a deterrent but is not strong enough to stop a determined dog. Measures: 32 x 32 inches. Successful use of the Net Pet Barrier might require some training with your pet. The Barrier acts as a deterrent but is not strong enough to stop a determined dog. Wipe with damp cloth or sponge and mild cleaner. No machine wash. Never leave pets in vehicle unattended. We have been trying everything to get my dog to stay in the back seat. Thought this would do the trick. Within 20 minutes into the first ride my dog was able to get through it and into the front seat. He is very persistent, and was able to do it quickly. Do buy this if you have a persistent dog. Good, but not for excited large dogs! This product is convenient once you have it set up but my large lab broke it the second time we used it. I think for any "normal" dog that doesn't freak out and keep trying to get in the front seat this would be a great product! Was easy to see through while driving. I got this for my 2 English springer spaniel we travel with them a lot and I wanted something to keep them in the back because they are getting big and don’t both fit to put there heads next to us . This thing drove me crazy my dogs got through and my dogs keep pushing through and going under it . I spent more time trying to keep them behind it that I told my husband I can’t stand this thing we has to stop and pull over at arrest stop and take it off . They behaved better with out it . I would not recommend this to anyone . Spend a little more money and get a better one that’s what I’m doing. I didn’t want to give it any stars but it won’t let me submit my review. This worked wonders for my dogs! They are great in the car but the first hour or so Carl constantly tries to get in the front seats and is always right on top of my head or shoulders so this worked well to keep them out! It’s not extremely durable so if a dog really wanted in front they could definitely get up there but it was all the deterrent my dogs needed to stay in the back seat! It’s worked wonders! Unfortunately, this didn't work with my hammock style seat cover. It may come in handy as a cargo barrier if I ever need my back seats for people. This screen lasted about 5 minutes with my dogs. the center brace broke and the frame twists easily just like if you were going to store it. The photo is totally deceiving as to how sturdy the metal frame is. Bottom line this is flimsy and will not keep your dog in the back seat. It’s a very nice product if your dog is well behaved. I bought this to keep my 3 dogs in the back ... but since it’s very bendy they walk right over it! I bought another one from different company, I had to return, because it didn’t work on our vehicle seats.This one stops my active Lab from jumping into front seats. We use it with a back dog seat cover for added support.